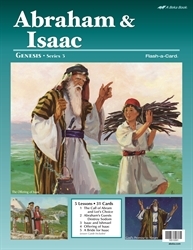 Teach your child about the Patriarchal Family with the Abraham and Isaac Flash-a-Cards. These 5 lessons and 31 pictures depict the stories of Abram praying for a child, God providing a substitute for Isaac, Isaac finding a bride, and more. Also included is a detailed lesson guide that gives you content to teach, prompts to use the pictures, and review questions for each lesson. Teach your child about the power of prayer and patience with these beautifully painted visuals.